A resolve on the part of its leaders to seek the will of the Head of the ChurchYou may think that this is a “given” among most leaders, but you would be wrong. Many pastors and church planters are very concerned with other pragmatic matters for the sake of church growth above praying, searching Christ’s word, and discussing Christ’s perspective and will as Head of His church. But even if these leaders are “effective,” they don’t impress me. 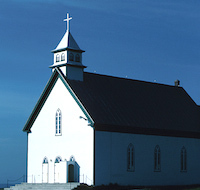 After all, even the worst of false teachers seem to be able to fill large halls with listeners and to carry out elaborate plans that dazzle us.All leaders cast vision, but few labor to know just what God wants by tenaciously pursuing the truth from the Scriptures where Christ’s will is to be found, and by praying for the Spirit’s wisdom and power. This doesn’t mean any team of leaders has it all figured out at any given time. It’s a process. Old practices have to be thought through again in the light of the New Testament—even basic practices like baptism, the Lord’s supper, music, money, leadership, and evangelism. Then, the church leaders follow the Head when they learn what He wants. There will be new understanding revealed to leaders in this pursuit, sometimes about things held sacrosanct by many, but the church can have confidence in such men who seek Christ’s will above their own. A willingness to do the will of Christ even if it doesn’t result in numerical growth.I love to grow numerically. Most of my church experience has been on the growth side. But I know something of the other side also. It’s easy to blame lack of growth on the church’s purity in devotion to Christ in order to relieve the pain. But in many cases it is better blamed on laziness, or distractions, or unwillingness to share the gospel, or being stolidly archaic rather than biblically sound. On the other hand, if Jesus is a model of anything, He certainly shows us that popularity isn’t always in God’s plan book. His crowds would swell, then nearly vanish. He would be accepted, then rejected. His truths often worked against His gains.A church must always understand the statement: “Beware when all men speak well of you” (Luke 6:26). But remember, returning to outmoded patterns of the last century (which once were not accepted because they were outlandishly modern) is not what I’m talking about. Carefully, thoughtfully, and tenaciously following the Head is. A desire to love the world and to love each other.We sometimes talk of the “ingrown” church. They can get that way. I enjoy being in a church of people on the whole who persistently reach out to each other and to the world of unconverted people. It’s a healthy situation in this respect. And for now, at least, almost all of our evangelistic ministries are initiated by the people rather than the leaders. Like you, we are sometimes chagrined at the small number of new converts resulting from our efforts, and wish for more of the power of God to save. Loving the world however, is important to God and should rank high in any church that is a true one, even if we don’t reach all the people we would like. God, you remember, loved mankind enough to send His Son.Christ’s church was birthed in love. It is the mark of Christian maturity and the fruit of the Spirit. No church can be a good church without it. There may be periods where love is not so obvious. Suspicion and sin will sometimes mar the church’s beauty. That’s what Satan loves. But any church of our Lord must pursue love with self-denial and resolve. It is a valuable exercise for leaders to evaluate the church in terms of love. Though there are many things a particular church may not be able to do well, love is not one of them. A resolve to make strong male disciples. Everyone in a church needs to grow spiritually, but on the main, if men are growing, the rest of the church follows. I can’t feel good about a church that isn’t mentoring men in a serious way. Paul told his missionary understudy, Timothy, to teach men who will be able to teach others also (2 Timothy 2:2). The word of Christ should course through the church because men are being taught effectively.Even so, mentoring men is not a priority in most churches. I can hardly believe what I’m saying since it is such a major component of my life and what I believe was in the early churches. Jesus and Paul modeled this method so clearly. Sometimes pastors lament that they simply don’t have any good leaders. My response is sometimes a little too curt: “Did it occur to you to make your disciples rather than import them?” I have to say that some pastors have done almost nothing over years of time to develop men, except to speak behind a podium on Sundays. But, if the truth were known, a man’s ministry is more likely measured by the mature disciples he leaves behind than the manicured sermons he gave, or the buildings he built. One hopefully helps us arrive at the other, but more than Sunday preaching needs to be going on. A persistent emphasis on developing a living, functioning Body.This may come as a surprise to you: if I were able to leave behind a legacy in the form of a famous mega-church of devoted listeners, a fine paid staff of remarkable leaders, along with a small, expert team of exceptional member-participants to help me, I would feel that I had largely been a failure as a Christian leader. I might feel OK about that if I were an Old Testament leader, like Moses. But in the New Testament, the apostles turned things over to primitive societies called churches, which are described as “the Body of Christ.” The unmistakably clear pattern the Lord intended was that of a Body of members functioning like bodies do, both in its meetings and in its day-to-day experience. Church leaders have to make something out of this repeated teaching. I contend, regardless of what others think, a church is not a good one unless participatory life is a growing reality.I’ve only done a fly-over analysis of a few salient aspects of “the good church.” I hope you are settled in one now. No church is perfect though. In the event you move to another area and find another church, perhaps this will help you locate the kind of church God is pleased with. It may not be the one that is most visible, but you’ll know it when you look more closely. Copyright © 2014 Jim Elliff.